A longtime popular restaurant on the Lincoln Highway east of Pittsburgh, Pa., was destroyed by fire yesterday. A blaze was reported about 1 p.m. Monday at The Winchester Room steakhouse, 1728 Lincoln Highway, North Versailles. Firefighters were on the scene for nearly eight hours. Anyone who has seen the Pixar movie Cars — or thought for a moment about how roads have changed over the past half-century — knows that bypasses around towns have a tremendous impact on traffic patterns. The latest to experience this shift are Tama and Toledo on the Lincoln Highway in Iowa. As reported by the Cedar Rapids Gazette, the 7,500 vehicles that daily went through the towns on U.S. 30 have been reduced to a trickle since a bypass opened. Motels and restaurants such as the King Tower Restaurant, below, are feeling the impact. Since acquiring the local landmark eight years ago, Kristy Tovar has made a decent living running the King Tower Restaurant on the east side of Tama. Since the $82 million bypass opened, though, King Tower is no longer visible from the highway. Tovar’s anything but confident about the restaurant’s future. “I never really thought that having this highway change would make that much difference, because most of our customers were local. I’d probably say business has been cut at least in half or more,” she said…. Since the days when it was known as the Lincoln Highway, Highway 30 has been the lifeblood of Tama-Toledo. Visitors recall the distinctive Indian head souvenirs sign at King Tower, which has been open since 1937, and the Lincoln Highway bridge that was an early architectural feature of the first transcontinental highway…. Brad Crawford is manager of the 54-year-old Big T Maid-Rite in Toledo. He said rumors are already flying about big restaurant chains like McDonald’s snapping up the good real estate along the bypass to open new restaurants. Crawford is saving to buy a service sign on the bypass, but the cost will cut into funds he’d otherwise spend to advertise in the local newspaper and high school yearbook. Scott Berka writes that while the city of Colo, Iowa, is still looking for someone to lease the cafe at Reed/Niland Corner, a farmers market will take place there Thursdays from July 1 – September 23, 4pm – 7pm. FRESH Produce! ~ ORIGINAL Crafts! HOME BAKED goods! ~ Ice Cream! If you are interested in being a vendor at the Colo Farmers’ Market, reserve a table for a week or the season by emailing them at colofarmersmarket@gmail.com or for more information contact Colo Development Group at (641) 377-2278. The adjacent Colo Motel continues in operation. It’s not often we report on Route 66 here at Lincoln Highway News, but an icon of that two-lane road has been destroyed in a fire. 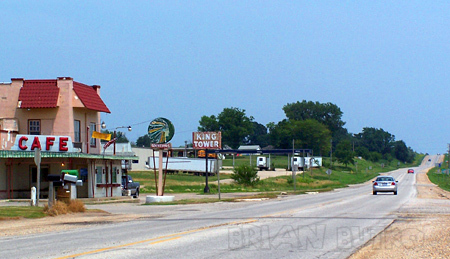 The Rock Cafe of Stroud, Oklahoma, was not only a popular stop along Route 66 since the 1930s, but had gained fame a couple years ago when owner Dawn Welch served inspiration for Sally the Porsche in the Disney/Pixar film Cars. As you can see in my photo above, they celebrated the connection with little cutouts of the car characters. 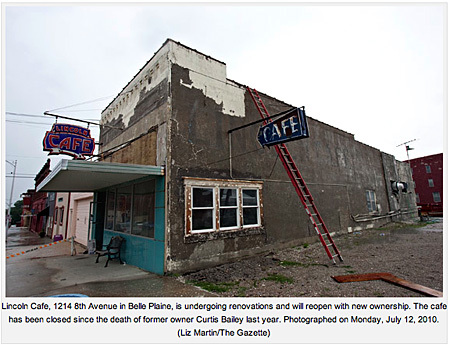 Read all about the fire, and plans to rebuild, on Ron Warnick’s Route 66 News. To see this image larger, CLICK on my photo below to go to my Flickr post – to see it even bigger, once there you can click “ALL SIZES” above the image. Randy Stone followed up the post about his family’s business — Stone’s Restaurant in Marshalltown, Iowa — with some great insights about the challenges in recent years. He also shared wonderful photos that we’ll spread out over a few posts. “The restaurant had fallen on hard times so my part of the family quit our jobs in Illinois and returned to Marshalltown in 2002 to try to salvage the business. We got great support from news media, loyal patrons and many others but could not make ends meet. The last thing we wanted to do was compromise quality or change the nature of the business from what it had been for 100+ years. We put in a new kitchen, upgraded the menu, and generally tried to make it a place grandma would have been proud of. Unfortunately, I think fast food and chain operations have flourished while independant businesses have suffered. At least that seems to be the nature of things in this part of the woods. Great times while they lasted though. Will the Crosser Diner ever reopen in Lisbon, OH? A bit of warm weather has me thinking “road trip,” through cold weather admittedly has the same effect. Looking through last summer’s photos, one of the best treats along the Lincoln Highway is traveling eastward across Ohio in the evening and arriving in Lisbon after dark. No matter the hour, the corner entrance of the Steel Trolley Diner beckons with neon, stainless, and a warm glow inside — not to mention pies, home fries, coffee, and milk shakes. 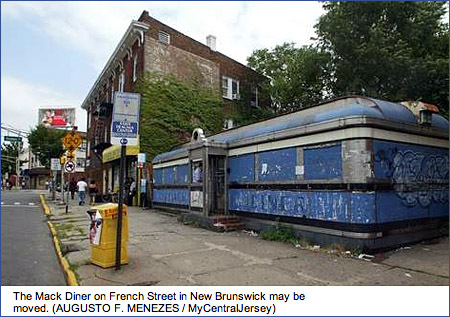 But for at least 6 years, the other side of town had brought a frown when I pass the abandoned Crosser Diner. It’s a c. 1944 Sterling diner made by J.B. Judkins of Merrimac, Mass., best known for their streamliner models featuring one or both ends rounded. This is a Dinette model, one of only 4 survivors. Above: Waiting for customers, and a buyer, is the rare Crosser Diner in Lisbon, Ohio. The diner (127 W. Lincoln Way) and adjacent service station were founded by Jimmy Hanna and later run by John Howard “Wimpy” Crosser and his wife Lorena Arter. It changed hands and struggled in recent decades due to its tiny size and having the main storage and kitchen downstairs, but it still featured solid diner fare and classic decor. One site reports a rumor of it moving but I’ve not seen confirmation or an update. It’s a treasure worth saving and reopening, with a cool little neon sign to match. Any diner fans or Ohio LH roadies know its status? US 30 eastbound was closed for 8 hours overnight as fire destroyed the Hollow Tavern in Unity Twp, Westmoreland County, just west of Ligonier, and about 40 miles east of Pittsburgh, Pennsylvania. Built 1939-40 as a restaurant and hotel along the Lincoln Highway in the Loyalhana Gorge, it was perhaps best known for a small concrete causeway across the water. The 2-lane LH ran past its door, but when westbound lanes were moved to the other side of the water in the 1950s, half their customer base disappeared. They fought for, and won, the small access crossover. The location, popular for its view, had housed a gas station and sandwich stand since the 1920s. The area was known as Kelley’s Hollow but acquired the Sleepy Hollow moniker from one of the owners’ habit of dozing in his rocking chair. The building resembled a big log cabin, and its old wood construction made fighting the fire difficult. Click HERE for no-narrator 1-minute video of the blaze from KDKA-TV (after a 15-second commercial). Also, click on the image above for a brief text report from WTAE-TV. During the California Chapter LHA meeting on January 12 at the new Nut Tree complex on I-80 in Vacaville, Fentons Creamery restaurant was presented with a Historic Lincoln Highway sign by chapter president Norm Root. It will be displayed along with artifacts and photos from one of the best-known attractions in California, The Nut Tree. Fentons traces back to 1894, and has been serving the San Francisco Bay Area at 4226 Piedmont Avenue since 1961. This second location opened here in 2007; it resembles a 1940s ice cream parlor with marble counters and tables, retro booths, and Art Deco lighting. The Nut Tree was founded in 1921 as a fruit stand under the shade of a walnut tree and grew into a complex of restaurants, gift shops, entertainments, a railroad, and even an airplane runway. Since The Nut Tree closed in 1996, locals have missed it, so redevelopment plans include nods to the attraction. At the free Nut Tree Family Park, the original Nut Tree train winds through the landscape and past the Harvest Express roller coaster, the I-80 Traffic Jammers bumper cars, California Carousel, and other custom kid rides. Click on the map below to download a large PDF version. The childhood home of The Nut Tree founder, Harbison House, built 1906-07, has been moved 1,000 feet south to the 3.7 acre family park behind the retail complex. It is being preserved by the Vacaville Museum and will include memorabilia showing the history of the Nut Tree and California. The development also includes lodging, resdiences, offices, and even the Nut Tree Bocce Grove, a two-acre park patterned after the grand public gardens of Europe containing 8 international regulation bocce courts. Visit the Vacaville CVB for more about the Nut Tree development. Another LHA sign dedication is planned for sometime in the next month at the Summit Garage in Altamont.